Earn a free weekend rental as of 3 rentals made on public rates! Enjoy free weekends! Enrol now and earn a free weekend rental when you rent 3 times in any one year(1) This can be redeemed from any Europcar location worldwide! Receive a 10€ discount Coupon voucher! Once you complete your second rental(1), we will send you a discount coupon voucher for you to redeem against your next rental! Renting on company rates? When you reach 10 rentals or 40 rental days, you will receive a free weekend reward while being upgraded(2) to the next tier level - Privilege Executive!Your negotiated rates remain unchanged. (2) All rentals - public rate rentals and promotional or negotiated rate rentals - are counted towards the next Tier upgrade. (4) once enrolled in the Privilege programme, just click on the dedicated Accor link in your online My Europcar section. After your first hire, you'll become a member and qualify for these benefits - automatically. 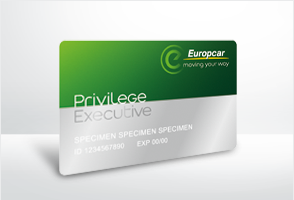 Once you're a member of Privilege Club, you start clocking up credits towards Privilege Executive. You qualify for these benefits automatically with 10 (or 40 days') rentals a year. Once you're a member of Privilege Executive, you start clocking up credits towards Privilege Elite. You qualify for these benefits automatically with 25 (or 85 days') rentals a year and as long as your yearly activity remains within these levels or above, your benefits are renewed at the beginning of every calendar year. You qualify for these benefits automatically after 15 rentals with your Elite card OR on invitaion and as long as your yearly activity remains within these levels or above, your benefits are renewed at the beginning of every calendar year.